I know from personal experience that dolls and their clothes can make an awful mess. 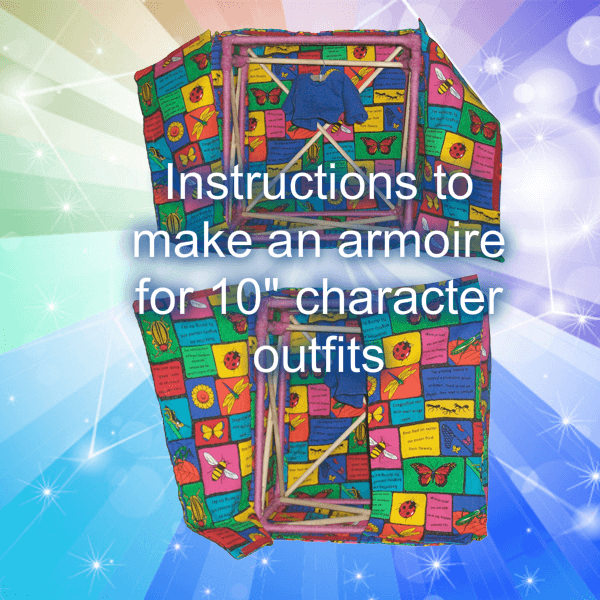 To help combat this, I’ve created instructions to build this very simple armoire to store favorite outfits. I even include instructions to make hangers! This attractively simple fabric covered dowel framework makes it easy to store all the outfits of your favorite Dream Angel characters and even the characters themselves – the human ones, anyway – keeping them safe within the Velcro-closed armoire. If you get tired of one cover, you can make another so it’s always trendy and fun. This is a PDF of instructions that include as much detail as possible with descriptions and images showing how to put it together. Questions and problems can be addressed through the contact page.